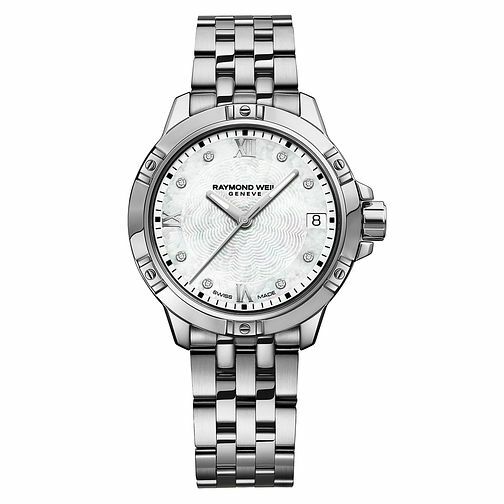 A luxurious watch from Raymond Weil, perfect for poolside swimming due to its water resistance of 100 m (330 ft). This timepiece comes with a stainless steel case and matching bracelet. The dial is an irresistible white mother-of-pearl, with Roman numerals and a set of 8 diamonds. Powered by quartz movement, it also features a handy date window at 3 o'clock position and folding clasp with double push-security system. Raymond Weil Tango Ladies' Stainless Steel Bracelet Watch is rated 5.0 out of 5 by 1. Rated 5 out of 5 by Anonymous from Perfect Birthday gift Bought as a gift for daughter's special birthday. She loves her watches and jewellery and although she has not yet received this watch, I am completely sure she is going to appreciate this when we give it on her birthday in two weeks.